Admins can choose to hide comments from reports that are flagged as profane or inappropriate. 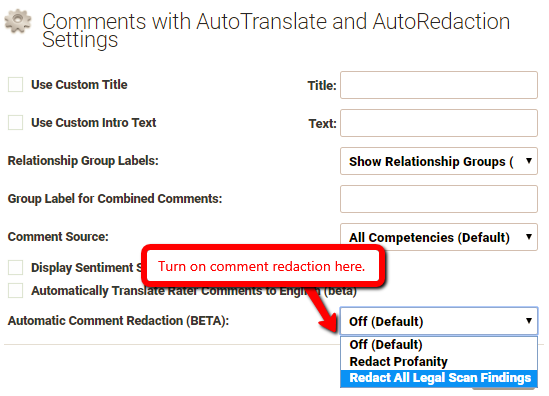 The auto redaction feature will remove all legal scan content (including what is entered your custom list) and replace the words or phrases with asterisks. Add the “Open-ended Comments” component to your report template. Click the "Settings" option on the right side of the screen for the Comments with Auto Translate and Auto Redaction component. Here, you will find the option to turn on the comment redaction feature by checking the box. Once you have completed customizations for this section click the "Close" button at the bottom of the window and your settings will be saved. NOTE: Comment redaction is a beta feature currently available in PRO and ENTERPRISE Editions of EchoSpan. Future availability is to be determined.